One of the first things I tried when I got my first Eee PC 701 last year was installing some audio editing software. As a radio producer and tech journalist, I’ve been wanting to try the open source Ardour digital audio workstation for a while, but I’ve always run into hardware compatibility problems. I didn’t really get Ardour to work well with the Eee PC, but the much more basic Audacity digital audio editing application worked perfectly. What’s more, through the magic of WINE, I was able to get the Windows-only Reaper DAW up and running in a matter of minutes. Fast forward nearly a year and I’m sitting here with an Eee PC 1000H in my hands. Audacity seemed to work out of the box, but Ardour was another story. I’m running Ubuntu on my Eee PC at the moment, so the easiest way to make sure all the proper packages were installed seemed to be to install the ubuntustudio-audio packages. Again, I wound up with glitchy audio playback. And when I went to uninstall ubuntustudio, I ran into all sorts of problems. Fortunately some kind Download Squad readers offered me a bit of advice that helped me get back the 600MB of disk space the packages had eaten up. So I was back to square one. And I decided to give Reaper another try. This time I installed WINE, installed Reaper, and I was greeted by the same audio playback glitches I had been hearing in Ardour. 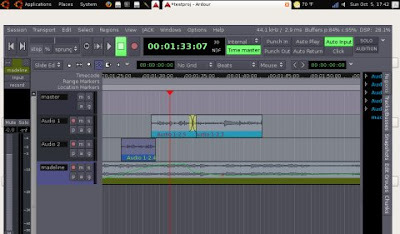 I did a little Googling and ran across one of the most useful tutorials ever written for someone looking to set up a digital audio workstation under Linux. Blogger Dave Hayes lays out step by step instructions for getting Reaper to work with WINE on Ubuntu Linux by using wineasio. Not only did this work, I found that Ardour worked perfectly after following his steps as well. That probably has more to do with the fact that Hayes shared his JACK configuration settings than anything else. But as someone who’s always only vaguely understood how JACK works, this was incredibly helpful. So I now have two professional quality digital audio workstations working on my Eee PC 1000H. Honestly, Reaper seems like it’s better suited to the Eee PC’s small 10.2 inch display than Ardour. But both applications provide a ton of tools for recording and mixing music, podcasts, or radio news reports. Great resources. I use a Macbook Pro for songwriting with Logic, but I always wanted something smaller to take on the road with me. The Eee PC is a nice alternative to do some basic audio work when pulling from something like a Sony PCM D50 (which I bought after reading your posts on it btw). I checked out Reaper and it seems pretty robust for the price. Sounds like a good combo. And Reaper runs great on Windows, so if you have an Eee PC or other laptop/netbook running Windows it should work perfectly. No tweaking necessary. I’ve just been trying for ages to get something a bit more powerful than Audacity to work on Linux and I’m elated to have finally succeeded in getting not just one, but two powerful DAWs working. thanks for this Post (wich for more tests like this on youtube), lattelly i´ve been looking into this, the eee 1000h for my music creation hobby .. and first i want to find the perfect sequncer for this kind of computers, im aware of reaper, and if it works as well as in my p4 im sold .. Theres also energyXT2 if you still looking for a linux sequencer..
My doubt is ..if the atom 1.6 can be a valid option for this, music creation.. i hope so! Hey Brad, I just came across this article about the Dell Inspiron Mini 12. Looks to be a contender to the Eee PC for a little more money. What's your take?